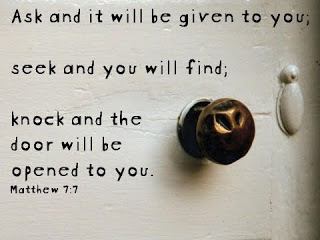 In the ancient book of Matthew, the author mentions “Asking, Seeking and Knocking.” We usually look at this as something we do to connect with God … and/or to ask him for favors. Asking is honoring the free will of another person. When we are asking, we are not judging, controlling or manipulating them – we want to know how they feel or what they think. Can I truly listen when I ask? Knocking means we won’t give up on someone. We will continue to hang in there with them … through thick and thin. How am I with sticking around and knocking … for the umpthteen time?! How can you ask, seek, knock instead of telling, showing and giving up on someone today? How can you aks, seek, knock instead of telling, showing and giving up on someone today? This one's easy…just open your heart and things will flow the right way. You'll 'know' what to do. Love this post Janet. Oh…so inspirational! Beautiful post. I will definitely practice this.